Successfully Added Sunglasses Camera with 4GB MP3 Player + Built-In Earphones to your Shopping Cart. 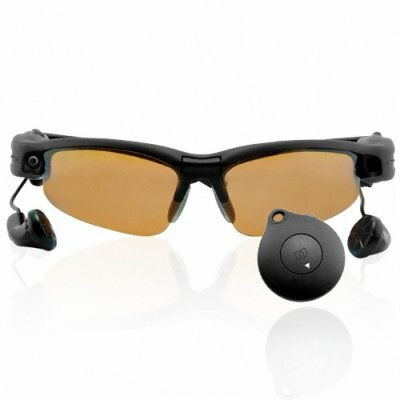 Sunglasses Camera with 4GB MP3 Player + Built-In Earphones. Stylish camera sun glasses with built in earphones. Take your pictures in style and ease using this covert style camera shades set with built-in 4GB MP3 player and earphones. With amazing quality and easy button or remote control, a long lasting rechargeable battery, and polarized lenses for eye protection, these mp3 shades make a great travel accessory for anyone. Whether you need a convenient camera for use during sports activities, private detective work, or just leisure, you can simply snap pictures of whatever you're looking at with the wireless shutter button in your pocket or sunglasses control buttons on the glasses themselves. Source your own style sunglasses right now, direct from us, and enjoy our low wholesale price and famous express direct shipping to you or your customers door within one week! A good product will always get customer's satisfaction. I do recommend these glasses,they are fun to have. The remote control is the best thing about the glasses.